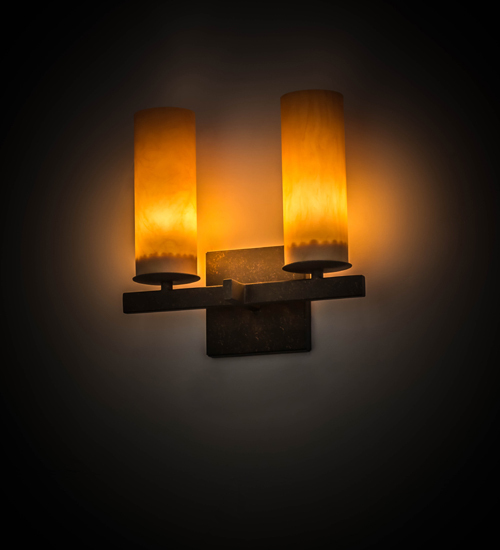 Description: Expert craftsmanship and a distinctive elegance come to light with a luxurious rustic wall sconce that entices all to see. Two Cylindres feature stunning Amber Quartz Idalight which is complemented with a sturdy frame and hardware in a Gilded Tobacco finish. The wall fixture is custom crafted by artisans in the USA in our 180,000 square foot manufacturing facility in Yorkville, New York. Custom styles, designs, colors and dimmable energy efficient lamping options such as LED are available. The fixture is UL and cUL listed for damp and dry locations.